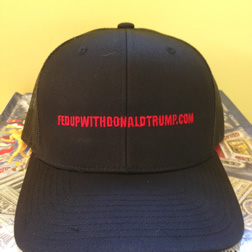 Fedupwithdonaldtrump.com, created in August 2015, has been continuously polling attitudes toward and opinions about then candidate and now President, Donald J. Trump, a child of Queens who lusts to be a King. The site founder, a well-known “unnamed source” has a personal history ranging from daily newspaper journalism to having been a senior executive at several Fortune 100 companies. In addition to providing knowledgeable but anonymous quotes to inquiring minds, he also maintains an independent consulting practice. He has no Russian clients, although he visited Moscow in 1988 on a corporate assignment. His commentaries have appeared on Yahoo, Disqus, in the San Francisco Chronicle, Marin Magazine and U.S. News & World Report, Bloomberg as well as numerous public sites including Bloomberg, Disqus, MarketWatch, Reddit and PoliticsMeansPolitics.com.